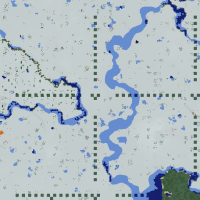 Some biome decorations such as snow, trees and structures sometimes fail to generate, producing very distinct 8 × 8 sections of land within a chunk from the surroundings. 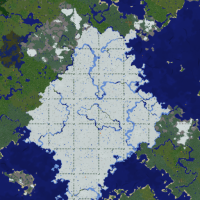 Something to note is that they appear to be random; after re-creating the world with the same seed and settings, some of these odd chunks are generated correctly, and other chunks which generated correctly before seem to suffer from this bug. Duplicate photos from the attachments show two versions of the occurrence: two in different worlds with the same seed, but only one showing the glitch. Because of the hard-to-reproduce nature of this bug, I can't guarantee the same seeds will produce the bug at specific places every time, but it should be easy to find an occurrence on a large ice plains' sheet of snow or villages' houses and paths. MC-125148 Surface terrain cut-off by chunk boundaries. MC-128526 Jungle Trees split by chunk borders form only half the tree. MC-131392 Tree Generation is Broken! MC-132655 Some trees generate incorrectly. MC-133454 Trees, Small End Islands, and Giant Mushrooms generate with sections missing.